As the summer winds down, Labor Day is traditionally the signal of the end of summer when actually it is the autumnal equinox on September 22nd. With the days growing progressively shorter and somewhat cooler, lawn repair and planting of new lawns is in vogue. Cooler and usually more moist conditions make for an ideal time to do lawn renovation. the emerging young seedlings moist until they root into the soil. At this stage, watering the lawn during dry spells is important to obtain expected results. Checking for hungry grubs too is a good idea before they strip off grass roots. Dylox is an excellent product that is environmentally friendly and yet effective in eliminating the grub stage of the Japanese Beetle and European Chafer. Another application of fall fertilizer high in potassium (K2O) at the last mowing will do wonders to thicken the lawn and thus closing spaces for weeds to grow in spring. This last fall fertilizing will aid in a quick green up in spring before the application of a crabgrass preventer and feed in the first half of April. 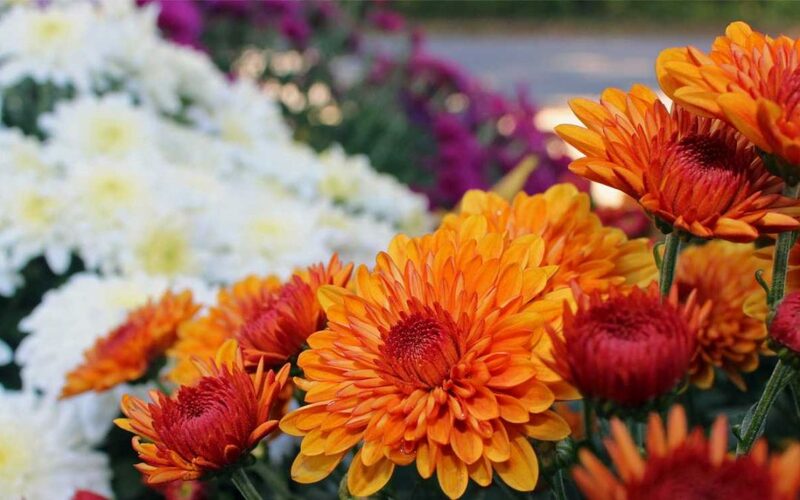 Fall signals mum time as well as the mums are sensitive to shorter days (photoperiodism) causing flower buds to form to open in late August through October depending upon the variety. At the nursery, thousands of mums will appear of various sizes including the super winter hardy Igloo brand mums. The Igloos are not a “true” chrysanthemum but a Dendranthemum; however, the appearance between Igloos and “regular” mums (Chrysanthemum morifolium) is blurred as they appear to be the same. The appearance is the only aspect of these species that is the same as the winter hardiness of the Igloos far surpasses that of the chrysanthemum which we refer to as a tender perennial instead of the misnomer “hardy mums.